I was deeply saddened to hear of the passing of chef Anthony Bourdain on June 8th. He was one of my favorite food writers and television personalities. A drug addict early in his cooking career, Bourdain turned his life around and became one of the most successful food personalities in America starting with his memoir Kitchen Confidential published in 2000. 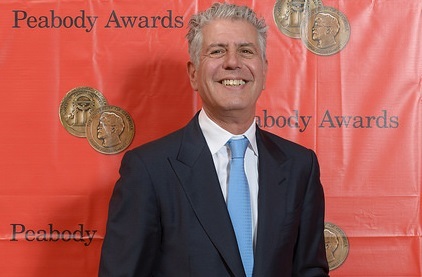 With his success, Bourdain frequently advocated for the underdog. He vindicated the value and flavor of traditional “peasant” foods, encouraged travel to developing nations and promoted the deliciousness of their local street food, was one of the few male chefs to ardently support the #me too movement, and also was a champion for the rights of immigrant restaurant workers. With his caustic New York cool, he reminded me of a kinder, gentler Lou Reed of food. Bourdain at the Peabody Awards for journalism, from the Peabody Awards flickr. Having spent many hours watching his TV shows (No Reservations, Mind of a Chef, and Parts Unknown) throughout my life, I feel a strange kinship with Tony. I really appreciated how his TV shows took viewers to countries they may have never thought of or wanted to go to, and gave them a basic understanding about the conditions and issues the countries faced. Through the lens of food, he did a good job exploring political and social problems from around the world. Though he was often sympathetic to the locals he encountered, he presented a balanced view on issues- usually featuring locals with varying perspectives. Some people think of food shows and writing as a light topic, but Bourdain proved it was more than that. Food is tied to culture, heritage, and living conditions. His sense of humor, compassion, and candor made his work enjoyable, but he wasn’t afraid to explore complicated issues. Tony was brave and honest in what he shared with his audience; he didn’t hide the more prickly parts of his life. Through his travels and openness, he encouraged his audiences to explore with an open heart. He will be missed. Medium Raw: A Bloody Valentine to The World of Food and People Who Cook (2010). Kitchen Confidential: Adventures in the Culinary Underbelly (2000). Bone in the Throat (1995). Anthony Bourdain, No Reservations: Collection 1 (2006), Collection 2 (2008), Collection 3 (2008), Collection 4 (2009), Collection 5, part 1 (2010), Collection 5, part 2 (2010), Collection 6, part 1 (2011), Collection 6, part 2 (2012). Mind of a Chef, Season 1 (2013).